You know how you all have dreams from childhood that just never seem to leave you? 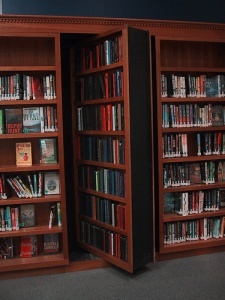 I want my future home to have secret passageways, hidden rooms, tunnels, the works! My friend had stairs in one of their cupboards that led down to a secret playroom! It was the coolest thing. Ever. The house we originally put an offer on in February had a bookcase in the hallway that opened up to reveal a staircase to the attic!! I've never been in a house with a secret passage. So long as it was really well lit and preferably not with flame torches, (because you know perfectly well that every flickering shadow is a ghost) I'd love to have my very own secret passage to my own private library. I think that's what they call "Crying for the moon" though. Any property with a secret passage, well-lit or otherwise, is going to have a crazy house valuation on top of it.